8 Cylinder, 4.8, Sequential-Port F.I. 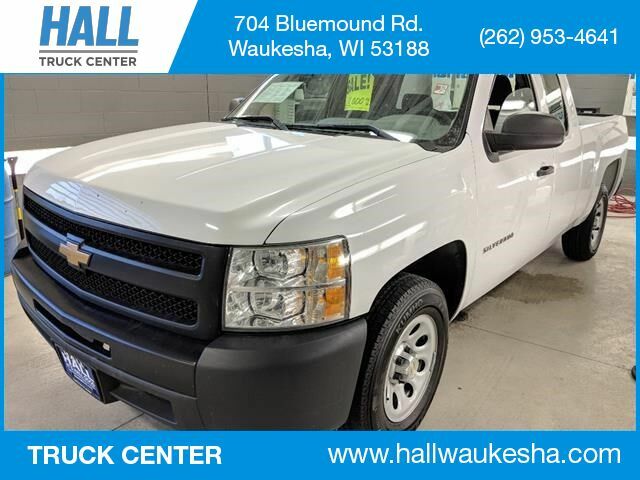 A 2012 CHEVROLET SILVERADO 1500 4x2 WORK TRUCK 4dr EXTENDED CAB 6.5 ft. SB WITH WHITE EXTERIOR, GRAY INTERIOR AND 145,489 MILES. **A TRUE ONE OWNER VEHICLE! EQUIPPED WITH BUMPER STEP, TAILGATE PROTECTOR, 40/20/40 SPLIT BENCH SEAT WITH DROP DOWN CONSOLE, CRUISE CONTROL, TRACTION CONTROL, WORK TRUCK PACKAGE INCLUDING RUBBER FLOORS PLUS VINYL SEATS AND CRANK WINDOWS, LIGHTLY TINTED GLASS, TIRE PRESSURE MONITOIRING SYSTEM, 14/19 MPG, 8 CYLINDER ENGINE, AND MORE!